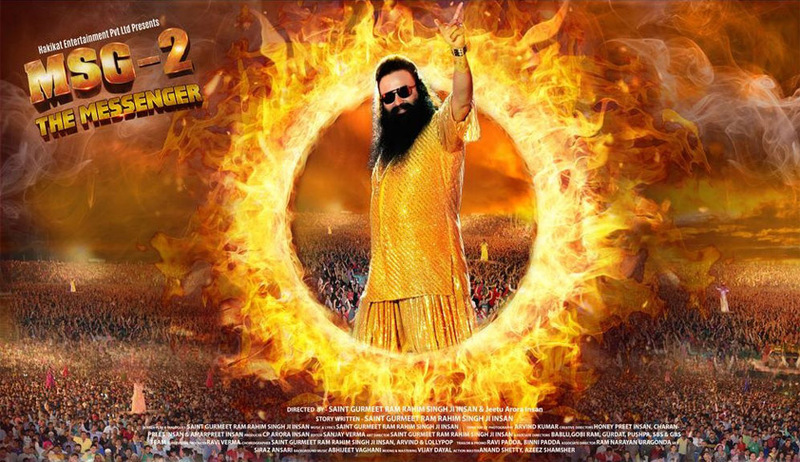 The Delhi High Court has dismissed a plea seeking a ban on screening of 'MSG 2: The Messenger', on Wednesday, on the ground that the film's trailer depicts a fantasy to the viewers and has to be understood in that light only. A Bench of Justice Rajiv Sahai Endlaw said the reference in the film to "Adivasi’s" is not found to be relatable in any manner to scheduled tribes. The plea filed by Prem Mardi, who belongs to the Santhal Scheduled Tribe of Jharkhand, sought an interim stay on the release of the Gurmeet Ram Rahim Singh starrer and said the matter should be decided after holding a special screening of the film. It was also further argued in the plea that the film is contumacious of a distinct group 'Adivasis' and depicts them as anti-national; neither humans nor animals but "Shaitaans" who have to be converted into "Insaans", which cannot be permitted. The plea had also sought quashing of the certificate issued by the Central Board of Film Certification (CBFC) to the film under Section 5 B (2) of the Cinematograph Act, 1952; and direction to the Ministry of Home Affairs to issue appropriate orders to 'YouTube' to take down the trailer of the said film from its website. The entire case of the petitioner is premised on the use in the film of the word ‘adivasi’. The petitioner assumes the adivasi’s to be meaning tribal’s or more particularly the scheduled tribal’s and thus finds the film de-sensitive of the tribal’s and more particularly scheduled tribal’s and promoting hatred against the tribal’s and scheduled tribal’s. "The subject of the film from the trailer is found to be depicting a fantasy to the viewers and has to be understood in the said light only. In fact, in some scenes in the trailer, Adivasi’s are shown with two horns and having the lower body as of an animal and the upper torso of a human being," the judgement quoted. “The petition by Mardi undermines the ‘average intelligence’ of Indian citizens and proceeds on the premise of viewers of film to be of such an intellect and understanding, so as to immediately after watching the film, they would start imitating the fantasy shown in the movie.” The purport of such film is only to transform the viewer to a dream/fantasy land, with no illusions whatsoever of the same mixing with reality. "In my opinion, only such films can be said to be having propensity of inculcating hatred, ill-will and violence towards a person or group of persons which show life as is ordinarily understood by the viewers and not a film which, to the average viewers understanding, is not depicting life but a fantasy or what is surreal," the judge said. Appearing for the Centre, Additional Solicitor General Sanjay Jain and Advocate Akash Nagar had contended that a reading of the entire script of the trailer does not make out a case of violation of the law to disclose an offence. The Bench further said that with the vast reach of the electronic and print media in each and every nook and corner of the country, people can't be said to be so naive as to be not able to distinguish between real and fantasy. "When the film traverses from the domain of real to surreal and depicts what none in his/her senses can believe to be possible and is in the realm of showing the impossible and fantastic, in my view it cannot be said to be capable of influencing any reasonable mind," it said. The Bench said the film is a work of fiction intended to show its protagonist who in his real life form also proclaims to be a spiritual leader, in a superhuman form. "I may thus reinforce that the term 'Adivasi' is not indicative of tribes or scheduled tribes but is indicative of the earliest inhabitants of any land whether it be in India or anywhere else in the world," the Judge said in his order while dismissing the petition.